Comparison exhibited is based on estimated industry averages assuming a 1,000 sq. ft. traditional office space. Prices are subject to change. Click to view. Your SMARTOFFICE Solution’s state-of-the-art meeting rooms and high tech business lounge provide smart full service space for you next meeting or event. 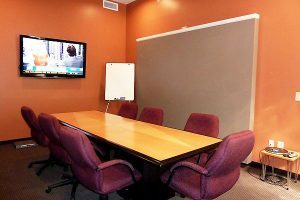 All meeting rooms are equipped with WiFi, plasma screens for presentations, and high-tech phones for conference calling. HOURLY & DAILY RATES AVAILABLE. All guests and hosts are subject to the Your SMARTOFFICE Solution Policy for Use and Your SMARTOFFICE Solution Rules and Regulations . Brokers, real estate professionals, and client referrals are essential components to Your SMARTOFFICE Solution’s success. We appreciate the confidence our esteemed colleagues place in us by providing referrals on our services. For every office or virtual deal contracted through a referral, we pay 10% commission on the total fees for the initial twelve months of the contract. We understand the value of delivering a great product andservice and will offer the perfect solution to every potential client referred to Your SMARTOFFICE Solution. Sending a referral to us is easy. Simply email the person and/or company’s information you are referring to referrals@yoursmartofficesolution.com and be sure to include your contact information as well so that we can contact you for payment once the deal is signed.